We cater for all of your self storage needs. We utilise 250 cubic feet containers which means that you only rent the volume that you need, keeping costs down. Our self storage Northumberland facility is secure, dry and well ventilated. We ensure that your property is kept safe at all times. We also provide a 'quick price' system which enables you to get the information that you are looking for, fast! So go ahead and get an estimate and then contact our team for friendly, sound advice. What is self storage Northumberland? Self Storage Northumberland is a service which we provide where you can store any amount of property for a period of time. There is no limit to how much you can store, or how long you can store it for. Why use self storage Northumberland? Self Storage is particularly useful if you are moving home and your new home isn't ready for you by the date you move. You can simply store your home's contents for a time until your new home is ready. We can take care of the full operation, from packing your home, through the transport phase into the store. When you are ready to move into your new home, simply let us know and we will deliver your property. Maybe your hobby has outgrown your spare bedroom or you're decorating and need to make room so that you can work unhindered. Perhaps your office is due for a tidy and you would like to free up valuable work-space or maybe you just feel like de-cluttering your home. Whatever the reason, contact Beveridge Removals and self storage Northumberland and let us take the stress away. 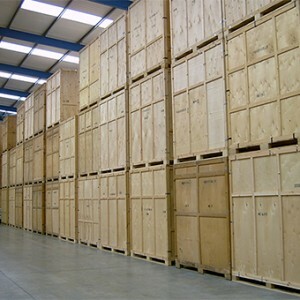 Here you can get a quotation on your self storage. The estimator only receives basic information from you so is only intended to provide you with a rough idea on price. All homes vary, as do sheds, outhouses and garden contents so if you'd like a more accurate estimate, contact us today. If you need self storage to store a full property then we have the solution. Click the button below and enter the details of the property and get a guide price. Our website only gathers basic information from you therefore the quotation given is a rough figure. Contact us using the telephone number below where you can speak to a real human being to further discuss your needs and firm up your quotation.